The first draft of ‘The Botany Play’ is finished! I now need to review/edit and shape it into a play for production. This is a delicate time as a play can be helped or ruined by development, it depends on so many things. But I have learnt that too many ‘cooks’ is definitely not a good idea. Also, a director or producer may want to invest their own ideas and impressions into the play they want to produce, and if that dialogue is to take place, it needs to happen early in the process. It’s a fascinating and very unique orchid – and critically endangered. 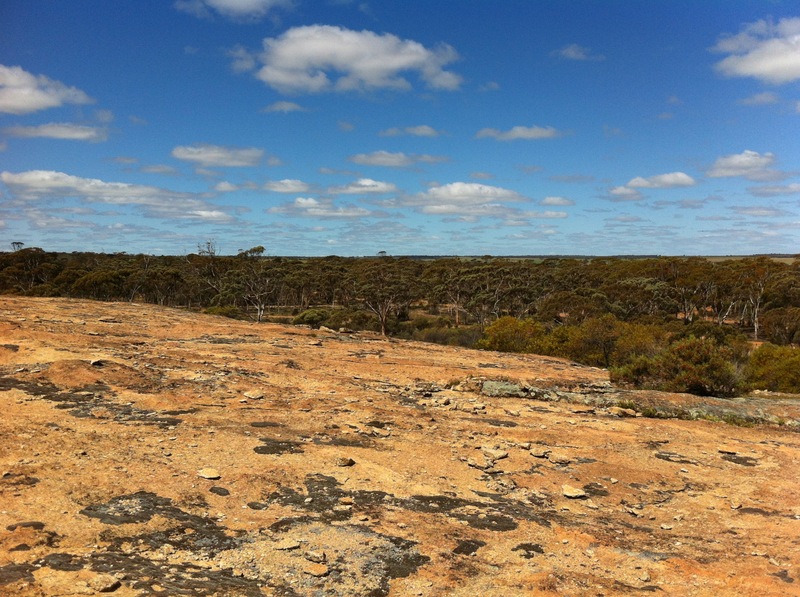 A view from Merredin Peak. I’ve been looking for a way to bring botany into a play for a while now. I researched the early plant collectors in Botany Bay when I visited the Sydney Botanic Gardens Library last year. Then, during my Arts Catalyst residency in London, also last year, I went to both Kew Gardens Library and the British Library to work on the impact botany had on Australia during early settlement. I’ve come up with some great stories and I needed a way to pull this all together. When I was offered the residency with the Cummins Theatre in Merredin I found the key to it all. This wheat belt town is located near one of only two sites in the world that contain the unique Western Underground Orchid (Rhizanhtella gardneri). Orchids themselves are connected to so much mythology, and social and cultural references that this sparked the idea for ‘The Botany Play’ (apt working title :-)). I’ve been developing this idea for the past 2 1/2 weeks and have come up with some scenes, which will be read this Saturday as a work-in-progress at the Cummins Theatre at 2pm. There’re so many ideas to draw from already, and having studied botany at University I feel like I’m returning to my roots – excuse the pun! But I’m drawing on much more than just the science. The Colonial botanist Charles Fraser wrote a report on the soils of Western Australia, saying they were suitable to agriculture. Unfortunately he got it wrong and the Swan River Colony suffered greatly, with some settlers dying of starvation. There are rogue plant collectors trying to make their fortune by sending unusual plants back to England and France. Sir Joseph Banks, who was on the ship The Endeavour with Captain Cook, was a preeminent botanist. The genus Banksia is named after him. He was a firm supporter of convict transport to New South Wales but corresponded with Empress Josephine, Napoleon’s wife, even when England was at war with France, believing that science was above such things. So there’s a lot to work with as an historical backdrop. However, the tension between conservation and using land productively for farming lies at the heart of the contemporary story in this play. Fingers-crossed I can pull it off. Then begins the much harder work of getting it produced somewhere – wish me luck!